It was confirmed for me again. We are more capable of thriving when our mindset shifts from negative to positive. Sure, you read that and think, of course it’s common sense. But it’s not common practice. We are much quicker to find fault outside of, and within ourselves, than find something well, worthy and wonderful. Last month I spoke to a group of women with diabetes at their monthly support group in Princeton, New Jersey. 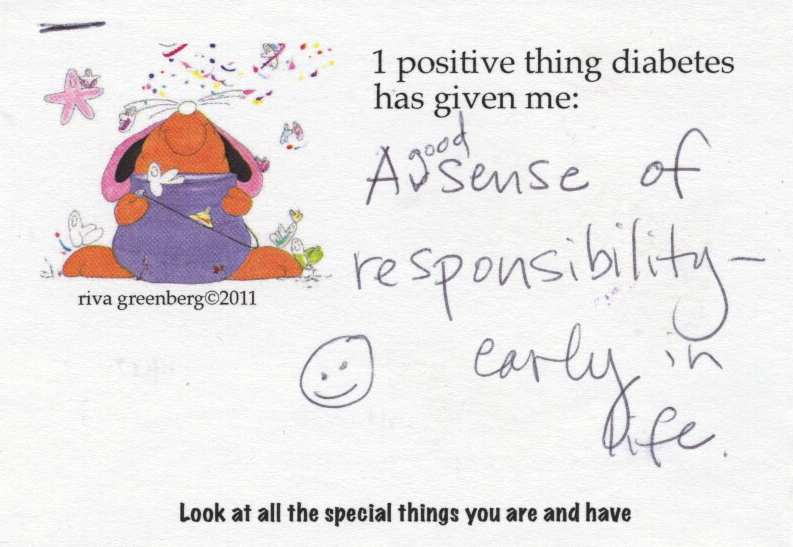 It was just like an evening I’d spent eight years ago when I introduced my resilience-based book, The ABCs Of Loving Yourself With Diabetes, to 26 women at a local diabetes support group in Manhattan. Their meetings always began the same way. The women went around in a circle introducing themselves and saying something about their diabetes. One quarter of the way around the circle the energy in the room would spiral seriously downward. They always spoke only of what wasn’t going well. Hosting the group that night I asked the women instead to say their name, something they love about themselves and one positive thing diabetes has given them. Love myself? A good thing from having a chronic illness? Silence reigned. Then one woman began. “It’s helped me lose weight,” she said. Another woman, “I’m more compassionate of other people less fortunate than myself.” Around the circle we went, each woman’s appreciation and positive thing lifting us all; one quarter of the way around the circle and the room was buzzing with their laughter and energy. It is strange that our medical system has not incorporated what we know into training clinicians, particularly those who will work with people who have a chronic condition. That people do better when they are praised than criticized. That we have more confidence and energy when we focus on what we want, not on what we don’t want. That fear may prompt action, but rarely sustainable action. And this is the same for most situations in life. Psychologist and professor at the University of North Carolina at Chapel Hill, Barbara Fredrickson, illumines in her ‘Broaden and Build Theory’ that positive emotions – appreciation, empathy, gratitude, awe, humor, joy, love, compassion – broaden our thinking. We become more creative, flexible, inventive and can see more possibilities. Positive emotions help us move forward and take action by strengthening our ability to connect with others and by building long-lasting inner resources. This past Saturday I led forty women with type 1 diabetes at the JDRF TypeOneNation Summit in New York City to see their strengths, what they appreciate about themselves and what good thing diabetes has brought into their life. It took no more than ten minutes to see and feel their physical transformation; they held themselves differently. They had laid down their burden and saw possibilities they hadn’t seen before. To understand the magnitude of this you must know Type 1 diabetes is one of the most complex, unpredictable and intensely self-managed conditions. One must be hypervigilant 24/7 making decisions about the effect of the food you eat, any activity you do, insulin dosing, stress, sickness, lack of sleep and more on one’s blood sugar to keep it in a safe range, and recover when it isn’t. You must accept that there are a dozen more bodily functions you don’t know or have any control over that influence blood sugar, and not beat yourself up when your body isn’t doing what you want or expect it to. These women breathed in a collective appreciation that our task every day is Herculean, and that we deserve to be proud of our efforts. We live in a culture that focuses our gaze on problems and tells us we’re not enough. That teaches women, especially, to see our imperfections. Yet the power available to us when we look inside and see our strengths, our accomplishments and all that we are and are capable of, is how we thrive and flourish living with an illness, and living our lives. Riva is the 2015 recipient of the International Diabetes Federation Lecture Award for education and advocacy. She is a leading global expert on flourishing with diabetes, corporate advisor, health coach and international inspirational speaker. Author of three books, “50 Diabetes Myths That Can Ruin Your Life and the 50 Diabetes Truths That Can Save It”, “The ABC’s Of Loving Yourself With Diabetes,” and “Diabetes Do’s & How-To’s”, Riva also writes a regular column on the Huffington Post, and a blog on her web site, Diabetes Stories. Riva has lived successfully with type 1 diabetes for forty five years, since the age of eighteen, is dedicated to helping people with diabetes live an exceptional life, not despite having diabetes but because of it, and helping health professionals work from a strengths-based, flourishing treatment approach.